In an eyebrow-raising gaffe, Google gave a Nazi-era name to an intersection in German capital Berlin on Google Maps service. The company later apologized for the error – but could not explain it. One would not expect any Nazi regime name to reappear on a map in modern Germany, where all things Nazi-related is taboo and a particularly sensitive subject. Internet giant Google, however, did exactly just that. 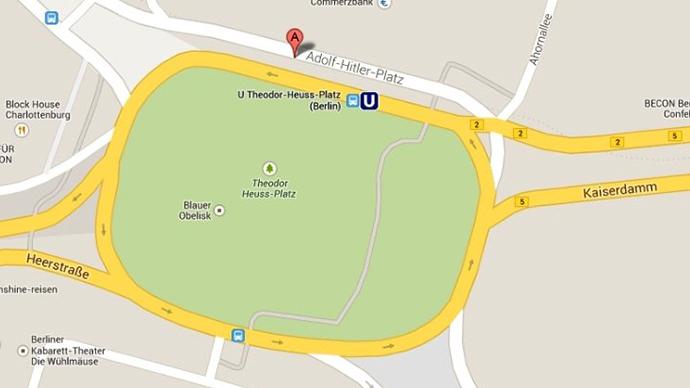 Any of the millions of Google Maps’ daily users could search for and view Adolf-Hitler-Platz in Berlin for several hours late Thursday, AFP reported. The name was placed on an intersection near a square, both of which in reality bear the name of West Germany’s first post-World War II democratic president, Theodor Heuss. “We were made aware of a false and inappropriate street name on Google Maps and corrected it immediately,” Google spokeswoman Lena Wagner said Friday. “We apologize for this mistake,” she added. According to Wagner, it was not immediately clear how the mistake occurred. Google executives later told Germany’s BZ newspaper that they were investigating the cause for the error. The blunder, however, clearly involved some history, as the area was in fact renamed after the fascist leader – only more than 80 years ago. The square, originally Reichskanzlerplatz, bore the name of Hitler from 1933 to 1947, after which it had its earlier name returned. In 1963, it was again renamed, this time after the late President Heuss, who, together with Chancellor Konrad Adenauer led the country from the ruins of WWII. Surrounded by a major roundabout, the square had an important role in Hitler’s design of the “world’s capital” Germania – a planned city that never came into being. Now known as Theodor-Heuss-Platz, it houses the Eternal Flame, a memorial for the victims of post-war flight and expulsion of Germans, and the Blue Obelisk – a 15-meter monument that has the history of Berlin and the historical locality Charlottenburg handwritten on the inside of its glass walls.